Times: Saturday-Sunday: 14:00; Monday-Friday: Available any time. Duration: 3-4 hours, including travel. Capture the flag, hide ‘n’ seek, war games, plenty of shooting, and full on adrenaline - welcome to paintballing in Prague! After picking you up from your Prague hotel, we drive for around half an hour to our outdoor paintball centre. The centre is set deep in the forest outside Prague - this is the real deal! In the forest there is a fortress, old army jeeps, bunkers and felled trees, which give the paintballing a military feel. There are plenty of places to hide in and attack from. On arrival you are divided into two teams, put on your protective camouflage overalls, and pick up your guns and paintballs. 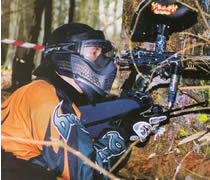 We then instruct you on the rules of paintballing, which include safety training. After this, let battle commence! To add spice to the event, in addition to the paintballs allocated to each player we load 400 free bonus balls into two machine guns housed in a bunker. You'll need to capture it though to fire them! This is an action packed activity, so the paintballing centre has on-site shower facilities for afterwards. Included in the price, we also film the day's action and post it to your home on a CD. After the activity we finish off with a few Czech beers, and we can also organise a steak BBQ (see trip options below). Old clothes, shoes, wash kit & towel. Price for groups of 6-12 people: £44/€49/1370 CZK per person. Price for groups of 13-20 people: £42/€47/1310 CZK per person. Price for groups of 6-12 people: £53/€59/1655 CZK per person. Price for groups of 13-20 people: £51/€57/1585 CZK per person. Price for groups of 6-12 people: £63/€70/1945 CZK per person. Price for groups of 13-20 people: £60/€67.50/1865 CZK per person. Price for groups of 6-12 people: £69/€77.50/2145 CZK per person. Price for groups of 13-20 people: £68/€76/2085 CZK per person. From £40/ €45/ 1310 CZK per person. -Guns, paintballs, protective camouflage overalls, masks & gloves. -400 free bonus paintballs loaded in bunker machine guns. -Free video of the action on CD.